Kevin Pickard talks about the Seminole Tribe of Florida’s season finale and plans for next year. L. Jon Wertheim and Danny Basavich talk about the new book Running the Table as well as the Lionsgate movie based on the book. Barry talks about the US Open, past and present. John Schmidt talks about what winning last year’s US Open meant to him. Luke Riches talks about the World Cup of Pool, Mosconi Cup and the World Championships. 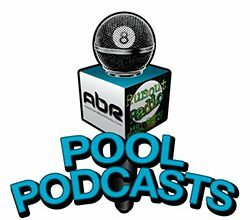 Monica Webb talks about the WPBA, instructors and a 10 ahead set with Karen or Allison. Ewa Laurance discusses the WPBA, Golf and television commentary. Yen Makabenta discusses the growth of pool in the Philippines and the Alex Pagulayan situation. Jim Wych talks about the new corporate sponsors and changes for the Canadian 9-Ball Tour. Jay Helfert talks about the pool/poker comparison, gambling in the Philippines and the Alex Pagulayan situation. Charlie talks about pool in Korea, pool in America, and what it will take to move pool to the next level.